It's the future, and a flaw with the mainframe computer sees robots and cyborgs going haywire and eradicating the human race - now a small band of resistance fighters sets out across the wasteland to pull the plug. If this game was more popular, I'm sure James Cameron would've had his legal team at the ready. This is the light phaser version of the game, so it's simple point and shoot. 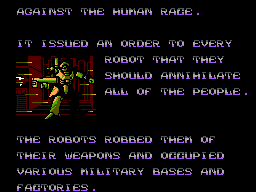 Essentially it's Operation Wolf with robots, if that sounds cool... that's because it is. You've not got any other weapons than your gun, although there are drones that lend you health, weapon power or a smart bomb - but watch your aim, one drone powers you up, hitting the other drains your health. On the subject of powering up, essentially all levelling up your gun does is give it a wider firing area - handy at times but frustrating on the last level, where you have to avoid shooting certain panels on the wall. You're meant to get rapid fire with a level up, but you get a better rate of fire from quick separate trigger pulls and it doesn't heat up your gun. 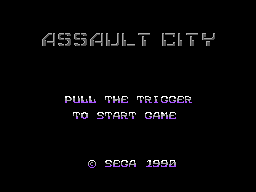 The main problem with Assault City is the bosses. Basically they're complete pussies. I can count on the fingers of no hands the amount of times I've been hit by the fortress or the missile launcher. The giant head and the big eye can only be hit when they're about to fire, which takes an age, so if you keep shooting they pose no threat at all - what's worse is these two tedious battles must be repeated before the final boss. Impressively the game features a difficulty level which is determined by your performance in a training gallery - a neat twist except that the game moves so slowly on the lowest level that it hurts. Once you're any good you'll wish you could by-pass it straight for the hardest level. Ultimately though, you're here because you want to shoot up some stuff. And that is done expectionally well here. For a game of its age, the graphics are pretty special. 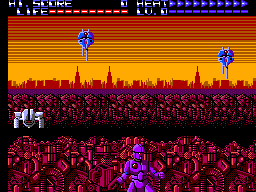 There's an array of flying things that zip around the screen while cyborgs pop-up right in front of you and fire without hesitation - each level has different enemies and they all look pretty impressive. Particularly the anime-esque mechas from the street battle. There is a problem though - explosions. There's no "death" animation, so the robots are generally just replaced with some explosions. I say generally, because only a couple of explosions can be on screen at once, which means some are subsituted for extra screen time for the sprite and then nothing - which can lead to the player firing several shots at something they've actually already killed but just hasn't gone from the screen yet... all while taking damage from elsewhere. Once you get used to it though, it's pretty minor - you just need confidence in your aim! What is great though is that you can put bullet holes in the background! You lose this ability when fighting the bosses (a shame, it'd break the tedium while you wait for them to fire), but on the whole it's fun to tear up the place a little. Did I mention the backgrounds are ace as well? There are also some neat little cut-scenes which, though full of poor word-wrapping and spelling mistakes, do a good job of advancing the story (they explain why you're fighting in the locations you're fighting in and everything!). They're also comically pro-firearms, with "the power of the gun" being granted as much credit for restoring peace in the end as the hero! The blasting effects are decent, the explosions adequate but somewhat muffled at times and there are some really annoying sound effects (those cool looking mechas make an awful screech sound). But the music! It's the sort of typically upbeat stuff that wouldn't sound overly out of place in an anime and makes the boss fights seem more imposing than they really are. Point and shoot, that's it. The accuracy is spot on (you'll only hit civvies and evil red panels if you're rubbish or packing a heftily powered-up gun for the first time - the wider blast radius takes a bit of getting used to), but watch out for the explosion glitch that can be mistaken for a hit detection one. There's also never an unfair amount of reaction time (hello Rambo III and your everyone fires at once route to certain death) to get your shots off before being hit, or catch up if you miss one or two baddies. Well, it's shamefully easy for anyone who's got some playing time in other rail shooters under their belts. But like any other game of its genre, it's not meant to be an in-depth experience - rather a 10 minute blast-a-thon for good old fashioned F-U-N. So fans of the genre will love it despite the naff boss battles - but it doesn't offer much to the un (operation) initiated (I'll get my coat). It's basically a superb rail shooter. The pathetic bosses stop it from topping the likes of Operation Wolf, but if you've got a light phaser then this game as an absolute must. Great graphics, music and an amusingly plagiarised plot with some entertaining pro-gun leanings. Ideal if you want a few minutes of destruction to fill in a gap in your schedule - just don't expect anything too challenging, and is probably far too rare a game to serve as an entry level to the genre.